Love snacking but are tired of munching on the same old, go-to foods? Enjoy eating healthy but feel like you’re spending a fortune on expensive products? Snack boxes are a fun way to sample a wide-range of surprises each month that are delivered straight to your door. You have many options when it comes to healthy snack box delivery, but Love With Food is not only a healthy option that is a nice alternative to store bought snacks, they also support a hungry child in need with every healthy snack box delivered to you. Learn more about this subscription service including features, pricing and more. Love With Food is a healthy snack box delivered monthly. All treats are organic or all-natural, so you don’t have to worry about reading the label. Unfortunately, you cannot specify any allergies or dietary restrictions, so this is not the right snack box for everyone. You don’t have to be in the U.S. to join the healthy snack box subscription fun! They ship anywhere in the world, so you can even get Love With Food in Canada or Australia and everywhere in between. Love With Food has three box options to choose from (and all include a printable note in case you want to give one as a gift). Shipping: Free US shipping and $3.99 everywhere else in the world. They also have office plans with snacks in higher quantities nicely showcased in a display tray to ensure you and your co-workers have a healthy alternative to junk food from the vending machine. They are so confident that employees will be fighting over these healthy snacks that they back their office plan up with a 100% risk-free money back guarantee. Love With Food is offering 40% off your first tasting box! Click here to take advantage of this offer. What Do Customers Think of Love With Food? This three and a half minute video is full of testimonials from real people who tried the box. They share a little more about what makes Love With Food great including a taste of what’s inside (literally). Love With Food: How Do Their Snacks Stack Up? 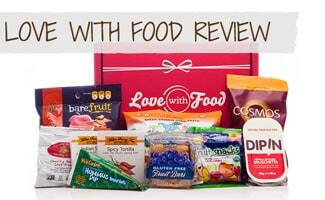 How does Love With Food “snack” up to our competition for best healthy snack box? They didn’t make our top picks, but they are super affordable given the value of what’s included in each box. It’s a great way to try new healthy snacks and to rest assured that what you are putting in your body is nutritious (without breaking the bank). Have you used a healthy snack box delivery service? Love that each box helps those in need, more companies should be more mindful like they are!